Shredding is only common sense privacy protection. Whether you’re protecting your sensitive personal documents or company documents, whether it’s junk mail or old correspondence, shredders are virtually the only way to get the job done right. Unfortunately, electric shredders have some fairly serious drawbacks. For one thing, they tend to measure roughly the size of a trash bin. And if you’re only shredding the occasional piece of junk mail, that tradeoff in space is one you won’t be eager to make. It would be like buying an apple-peeler that’s the size of a microwave. Fortunately, there are simpler solutions which are just as effective. Manual hand shredders are usually small enough to store away on a counter, behind a cupboard, on a shelf, in a drawer, or otherwise out of the way. And because you don’t have to buy a small motor, they’re considerably less expensive than ordinary shredders. But it still helps to know how to avoid choosing the wrong one. The list of things you’re looking for is rather simple. You want to examine the durability of the shredding mechanism, both its mechanical handles and the blades. Portability almost goes without saying, but some manual hand shredders are more portable than others. Finally, you’ll need to think about the types of paper you want to destroy, as well as how shredded you’d like them to end up. 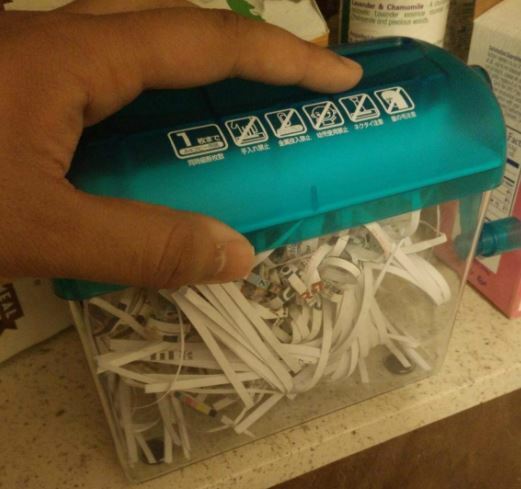 It’s within seemingly small details like these which makes the difference between cheap knockoff manual shredders, and a home office companion you can use for years. There’s even some wiggle room when it comes to aesthetic, though most portable manual hand shredders for the office are made to blend in to an office environment. How long do the blades stand up to a steady stream of shredding? Sooner or later, any shredding blades are going to wear down. When that happens to a portable manual hand shredder, the shredding process can get a bit tougher on your forearms, and you may want to end up replacing the unit. Fortunately, paper products won’t wear down well-made blades quickly, as you may have noticed from using scissors. One of the biggest reasons why people turn to manual hand shredders is for saving space. A full sized mechanical shredder takes up about as much space as adding an extra trash can to a room. By contrast, hand-held shredders are usually small enough to either store on a counter, in a drawer. But the portability of a shredder may actually be largely determined by something beyond its size alone, as we’ll see in a moment. Portable manual hand shredders are powered by hand cranking. Anytime you’re buying something with moving mechanical parts, it’s worth looking carefully at the quality of their construction. The length and position of the handle will determine how much force is necessary for use, and the quality of the build will determine how much risk there is to damaging the handle mechanism in the course of regular use. And then there’s the style of the hand shredder. Most hand shredders use one of two design types. The first type is quite similar to a regular shredder. With this type, there’s a small opening for paper, beneath which is constructed a collection space for debris. For this type of manual hand shredder, the grip on the bottom side of the shredder’s body can be an important factor. That’s because how the force of cranking the handle can cause the shredder to slide or reorient itself during use. The second common type of hand shredder is held over a trash can because it provides no receptacle for collecting debris. These types of shredders can be more physically exhausting to operate because there’s a small level of coordination required during the process. That means it’s not ideal for shredding dozens of documents in a row, but the smaller size of this type makes it great for storing away between uses. What kinds of paper can you feed through the shredder? 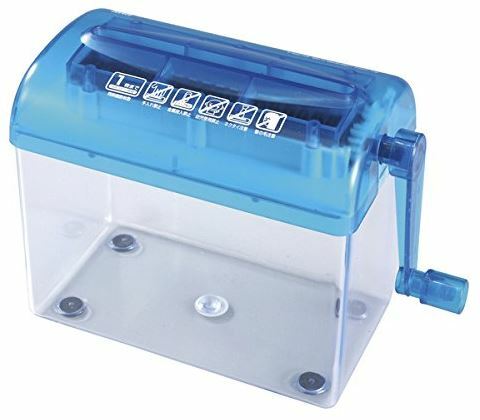 Most portable manual hand shredders are typically built to take-on envelope sized media as opposed to full sized paper. But with any decent hand shredder, you’ll be able to pass through full-sized sheets after folding them first. You may also want to know if the shredder can take on alternative varieties of print media, such as card stock. How shredded is shredded enough? For documents with higher security information, you may want your documents to be totally obliterated. That may involve not just shredding, but cross-shredding each document. You may still want to look at the size of each shredded fragment to determine if the destruction is adequate for your needs. The SENREAL Hand Paper Shredder is a manual mini shredder, build to take on A6 paper and similar desk stationary. 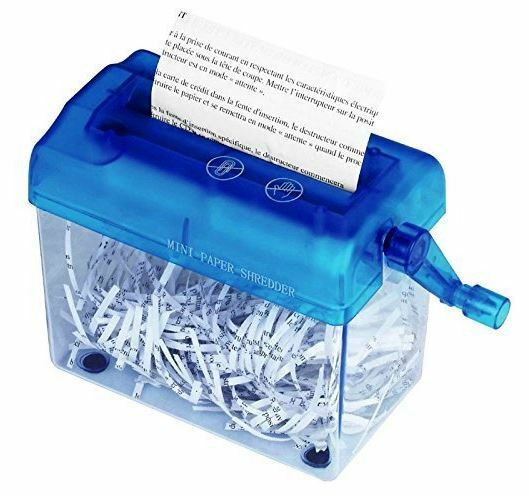 It’s not equipped to shred through anything beyond paper, and certainly isn’t going to work well if you start feeding through paperclips. But it’s ideal for bills, receipts, most junk mail, and similar tiny bits of paper. 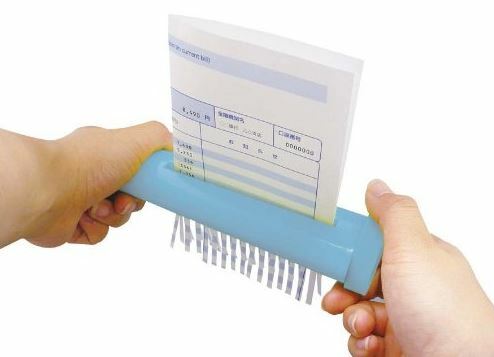 The SENREAL Hand Paper Shredder measures 6.7 x 5.9 x 4.1-inches, and weighs about four ounces. Once you’ve got it in your hands, the first thing you notice is the smooth mechanical action as you turn the handle. Internally, the somewhat greater capacity of this shredder makes it the right choice for someone who’s doing higher volumes of hand-based shredding. Alternatively, that can be useful for someone who’s taking fewer trips to empty their shredder. The top of the SENREAL Hand Paper Shredder, the media insertion space is 4.8-inches wide. That’s on the smaller side for a portable manual hand shredder, but it’s nevertheless large enough to fit in essentially any ordinary-sized documents. 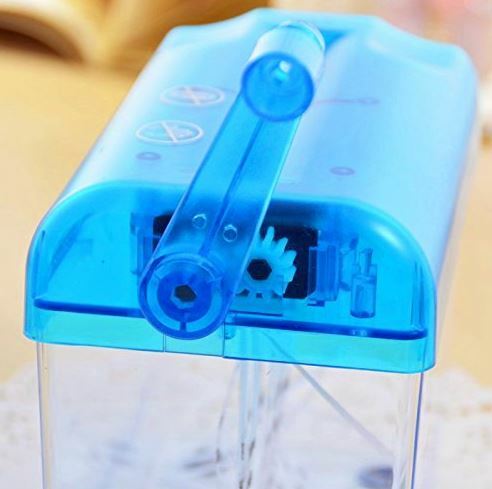 As you turn its handle, the SENREAL Hand Paper Shredder shreds your documents into tiny 0.2-inch segments. Those fragments are single shredded, but the design of the SENREAL makes it rather simple to do a second pass of shredding if you feel it’s necessary. As one might hope, operation of this hand paper shredder is quite simple. The base of the SENREAL shredder has four rubberized feet to help maintain the position of the mini shredder while you use it. The SENREAL Hand Paper Shredder also has an unusually broad available selection of colors for home office equipment, including navy blue, orange, and rose. However, there is one point of minor concern. The construction of the shaft handle for the SENREAL Hand Paper Shredder could be sturdier. When using the handle extensively over time, you may find it skipping-a-beat within the metal crankshaft. If this issue develops, it’s a fairly simple problem to fix on your own. And avoiding it is generally as simple as being gentle with your shredder, but it’s still worth knowing. The Sanwa Supply Hand Shredder is a Japanese import. Japanese office culture places fairly high value on their instruments, and the Sanwa shredder is a fairly good example. Ideal for slicing through double-folded A4 paper, this straight-cut shredder is both well designed and well-made. Although hand shredders and high volume jobs don’t go hand in hand, the Sanwa Supply Hand Shredder comes quite close to being an exception to those rules. Although this shredder has many things going for it, its best feature has to be portability. The Sanwa Supply Hand Shredder uses a compact 7.3 x 6 x 4.2-inch design, which can easy be tucked away on a shelf or within a drawer. 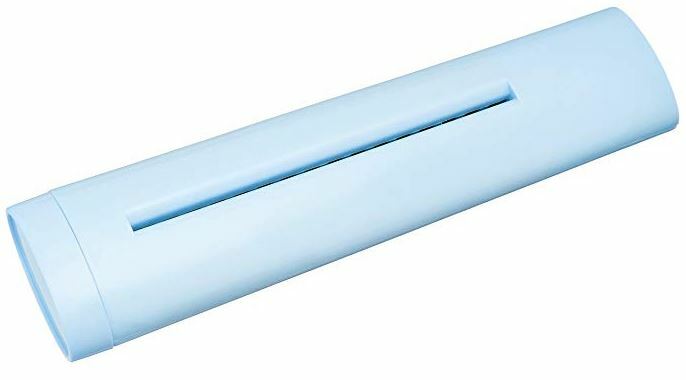 Its bright-blue top contains the shredding element, which is paired with a simple crank handle. Beneath that, Sanwa has placed a sealed clear container to help capture the debris, for which the 1.5-liter capacity provides ample of space. The entire kit weighs scarcely over one ounce. People tend to think heavier is better, but it would be a mistake to think of the Sanwa Supply Hand Shredder as being cheap, or as being second-tier office equipment. On the contrary, this hand shredder has what may be the sturdiest manual crank handle of any on the market. And it’s conveniently held at a gentle 45-degree angle, which it allows for smooth operation. It’s rather transparent that the Sanwa Supply Hand Shredder was made in Japan. Internally, its sharpened Japanese blades hold up exceptionally well with use. It’s easy to see this shredder performing admirably for more than a year of regular shredding. And although this is a straight-cut shredder, if you really want to cross-cut, feeding through paper at an angle isn’t tough to do. Often times, portable and manual equipment can be underwhelming when it comes to raw power. But the IPPINKA Portable Hand Operated Paper Shredder doesn’t have that problem. 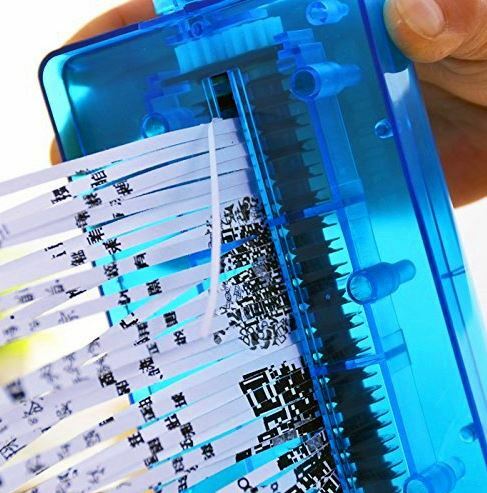 It can shred 2-pieces of A6 paper simultaneously without skipping a beat. And the fragments which it shreds are left in decimated 0.13” pieces. 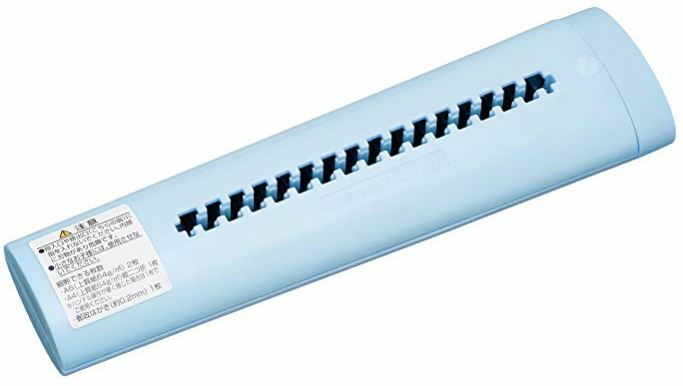 Similar to Sanwa’s hand shredder, the IPPINKA Portable Shredder was constructed in bright blue. But rather uniquely, it’s lengthy body looks nothing like Sanwa’s shredder. It stretches 9.8 x 1.1 x 3.8-inches, using a slightly less common container-free design. That means it’s intended to be held directly over a trash can while in use. Cranking each end of the shredder is smooth and relatively easy, but it does involve a bit of a balancing act to load the intended document and then begin shredding. Fortunately, that balancing act isn’t difficult because the IPPINKA Portable Hand-Operated Paper Shredder weighs only five ounces. When you’re using externally angled crank handles, like with SENREAL or Sanwa, mechanical damage to the handle is almost inevitable. As you use the shredder time and time again, those handles will be prone to breaking down sooner or later. By contrast, the much shorter mechanical turning handles used by IPPINKA’s portable shredder are virtually indestructible because they’re built directly into the body of the device. Compared to somewhat bulky container-based shredders, the IPPINKA Portable Hand-Operated Paper Shredder is compact on another level entirely. Its length-oriented design makes it easy to store away inside a drawer, the same way you might store a ruler. The SENREAL Hand Paper Shredder Mini Cutting Machine is marginally smaller than the Sanwa Supply Hand Shredder. That means you end up having to empty it out more often. But because manual hand office shredders are more about portability than workload volume, this is a fairly minor concession. As such, the SENREAL hand Paper Shredder a good choice for someone who’s looking for a fairly simple yet highly portable hand shredder. The SANWA Supply Hand Shredder is slightly larger than SENREAL’s shredder. You may or may not like that aspect of its design. But you’ll certainly like that it uses a rock-solid handle. If you’re only shredding the occasional junk-letter, then virtually any manual hand shredder will be able to help you out. 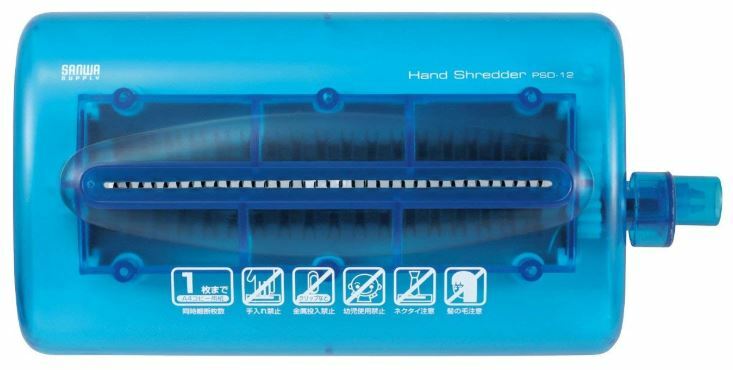 But the Sanwa Supply Hand Shredder is uniquely a good choice for its lasting power, as best provided through its exceptionally high quality Japanese blades. And then there’s the IPPINKA Portable Hand-Operated Paper Shredder. In short, IPPINKA provides a highly a portable and lightweight manual hand shredder for the office. The elongated design is great for saving space, provided that you’ve got two free hands and a trashcan to help you out as well. If you’re looking for a low-volume instrument with the best possible portability, then this may be your best choice. What’s the Best Identity Theft Protection Roller Stamp?